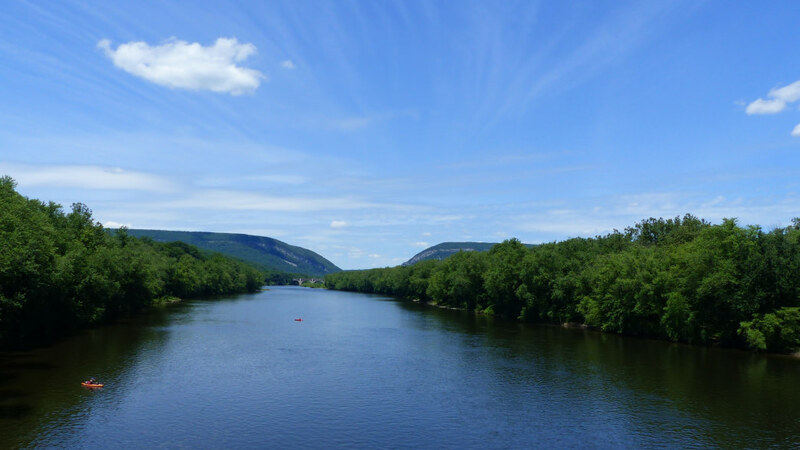 The Delaware Water Gap, which straddles the Delaware River along the Pennsylvania-New Jersey state line, is an historic destination that offers some of the Poconos&apos; best hiking, cycling, boating, and camping. With its concentration of waterfalls and scenic outlooks, this 70,000-acre protected area draws visitors from across the East Coast to enjoy its natural beauty. Less than two hours from both New York City and Philadelphia, it has long been an outdoor retreat, especially in the summer. The Appalachian Trail runs through the preserve, and countless paddlers take advantage of this breathtaking section of the Delaware River. While it was declared a national recreation area in 1965, the Delaware Water Gap had its first spike in tourism more than 100 years ago when the railroad brought easy access to fresh air-seeking urban dwellers. It continues to serve as an oasis for outdoor lovers year-round, with more than 100 miles of hiking trails, three swimming beaches, memorable drives, and links to its colonial heritage. No matter how you like to spend your time, you’ll find something to love at this treasured national recreation area. As long as people have lived in this region, they’ve been drawn to the Delaware Water Gap. The construction of Old Mine Road in the 1600s first spurred its modern development, and the road became one of the first commercial highways in the United States. Visitors can still bike and drive this route to see the remnants of colonial homes along the trail. The late 1800s and early 1900s ushered in a new era for the region: the resort boom. Wealthy Victorian families looking to escape the big city heat in a pre-air conditioning world found Delaware Water Gap to be the most accessible mountain area thanks to new railroad lines. Victorian mothers and children would stay for weeks at a time, if not the whole summer, and fathers who worked in Philadelphia or New York City would join their families on the weekends. The Water Gap is a mile-wide chasm carved between Mount Minsi and Mount Tammany. Once called a Wonder of the World, the special feature wowed crowds and established the Delaware Water Gap as one of the East Coast’s busiest resort towns. Lavish resorts like Water Gap House and The Kittatinny were built and expanded to accommodate its popularity, and high society activities came to the mountains along with the crowds. Opulent events, dances, and famous guests became the norm. Victorian guests would also spend time outdoors much like today’s tourists, canoeing, hiking, and taking in the scenery. The Delaware Water Gap became a national recreation area in 1965, protecting the area from development. But the Gap’s fame was not to last. In 1915, a fire broke out at the newly rebuilt Water Gap House, and the whole structure burned to the ground. A new hotel was announced to be built on the same site, but was never constructed. The Kittatinny followed in 1931, destroyed by a fire in just a few hours. These fires, and the growing use of automobiles, effectively ended the area’s golden era. Delaware Water Gap sat quiet for many years, but gained new status as a national recreation area in 1965, and today has been rediscovered by outdoor enthusiasts. Though the I-80 freeway now runs right through the Delaware Water Gap region, it’s still easy to escape the beaten path for peace and quiet. It’s a hotspot for visitors from Philadelphia and New York City who venture here to hike the miles of trails, paddle down the Delaware’s pristine waters, camp on islands, and find historical remains of the region’s vibrant past. 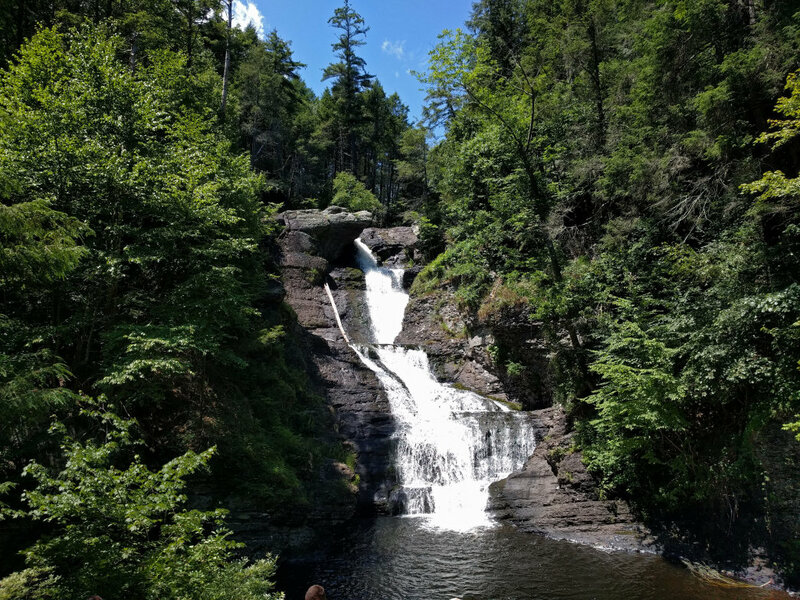 Sights like the 1,000-foot deep Delaware Water Gap and nearby Raymondskill Falls are still dazzling today—and it’s easy to reach these water-filled wonders. Whether you visit for a day, a weekend, or a week, there are a variety of ways to explore the region’s must-see marvels and awe-inspiring attractions. Hike the Appalachian Trail near the Delaware Gap. Thru hikers journey 2,200 miles from Georgia to Maine on the famed Appalachian Trail, but you can sample it without the commitment on a day hike to Mount Minsi. Begin at Lake Lenape and follow the white-blazed route over streams, past blooming rhododendrons, and to Water Gap viewpoints before reaching the Mount Minsi summit at 1,461 feet. Extend the hike to see more of the Appalachian Trail, or cut the descent short and follow an unmarked fire road all the way back for a 5-mile round-trip distance. Find every kind of camping in Delaware Water Gap. Whether you love hiking to remote backcountry campsites or pulling the car up to developed ones, you can sleep under the stars at the site of your dreams. For groups looking for river views and quiet, stay at the Mountain Vista Campground, which features secluded campsites and cabins. The Shawnee Inn and Golf Resort is just two miles from the Delaware Water Gap, and it offers premium cabins and tent glamping sites, for those who like to add a bit of luxury to their outdoor adventure. Or you can wheel your RV to the Delaware Water Gap KOA in East Stroudsburg, Pennsylvania, for big rig-friendly sites. For a unique experience on the unspoiled Delaware River, paddle a canoe to one of the many islands and camp. Raymondskill Falls is Pennsylvania’s tallest at 150 feet. Raymondskill Falls is the state’s tallest at 150 feet, and it is only a few feet shorter than Niagara if you add the height of its three tiers together. The 0.3-mile trail is a bit steep and uneven, but leads to epic upper and lower viewing areas. Bring out your bike for a ride along the McDade Recreational Trail, a packed gravel path that parallels the Delaware River on the Pennsylvania side. It showcases farm fields, forests, and river views along its 32-mile course. Overheating? Pause your ride at beaches along the route and cool off with a swim. 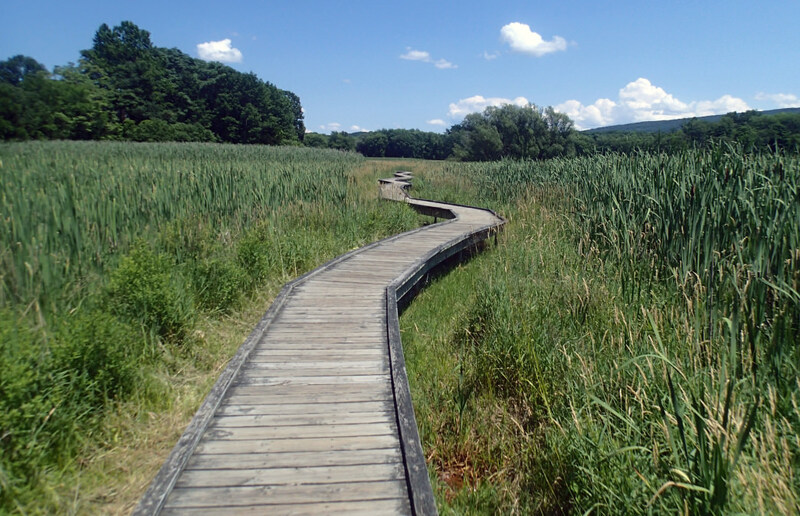 You won’t find sandy beaches here, but Milford and Smithfield beaches on the Pennsylvania side offer grassy spots for lounging, picnic tables, boat and canoe launches, and access to the McDade Recreational Trail. Lifeguards are on duty every weekend from mid-June through August so you can safely swim in the Delaware’s crisp waters. Paddle past mountains, forests, and rural landscapes. Paddle on one of the largest, free-flowing rivers in the contiguous 48 states at Delaware Water Gap. The middle section of the Delaware, a National Scenic and Recreational River, flows for 40 miles, and is known for its calm, clean waters. 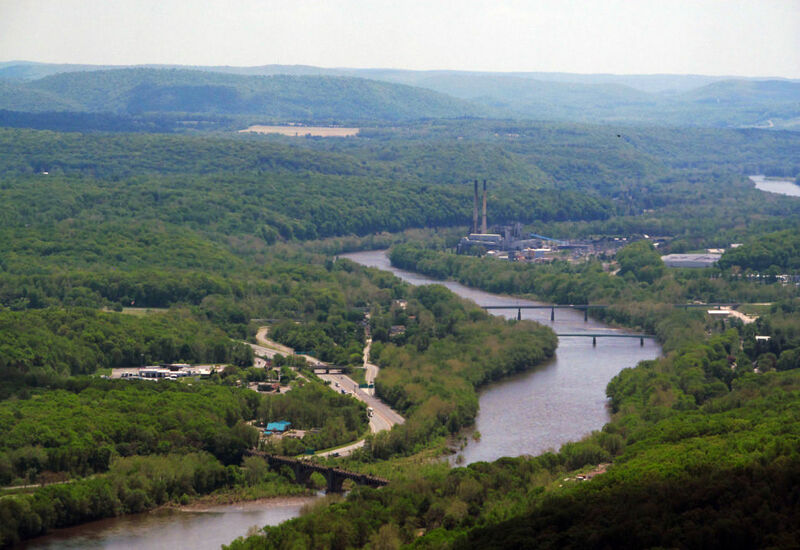 Edge of the Woods Outfitters is located in the heart of the Gap, and provides water trips down the Delaware River. Paddle past mountains, forests, and rural landscapes on this easy stretch that’s welcoming to new paddlers. Canoeing or kayaking through the Water Gap is a trip highlight. Free shuttle service is provided on summer weekends for those bringing their own canoes or kayaks, and outfitters along the Delaware also rent canoes, kayaks, and rafts. Located within the Delaware Water Gap National Recreation Area, the Pocono Environmental Education Center has been an educational partner of the National Park Service for more than 40 years. The center’s mission is to promote environmental education, sustainable living, and an appreciation of nature through hands-on experiences. It offers single-day, multiple-day, and multiple-week educational programs for groups ranging in size from 15 to 300. Families can enjoy weekend getaways that include lodging, meals, and educational programs, with activities like canoeing, orienteering, and hiking available. Treat yourself by going to the Deer Head Inn, which for more than 60 years has been providing great food and live jazz to the region. In fact, it’s one of the oldest continuously running jazz clubs in the country, with the four-story hotel features live music from Thursdays through Sundays. Just off the Appalachian Trail, the Deer Head Inn offers breakfast on the weekends and dinner from Thursdays through Sunday. The menu offers a mix of classic American fare, with steaks, seafood, and vegetarian options in addition to burgers, salads, and sandwiches. A quick note: A severe winter storm in 2018 caused significant damage, with downed trees and power lines causing the closure of much of the trail system. Park officials are working to restore full-access as quickly as possible, but it’s best to check the website for updates to the progress. Pack up the car and get away from it all with a Poconos camping trip.